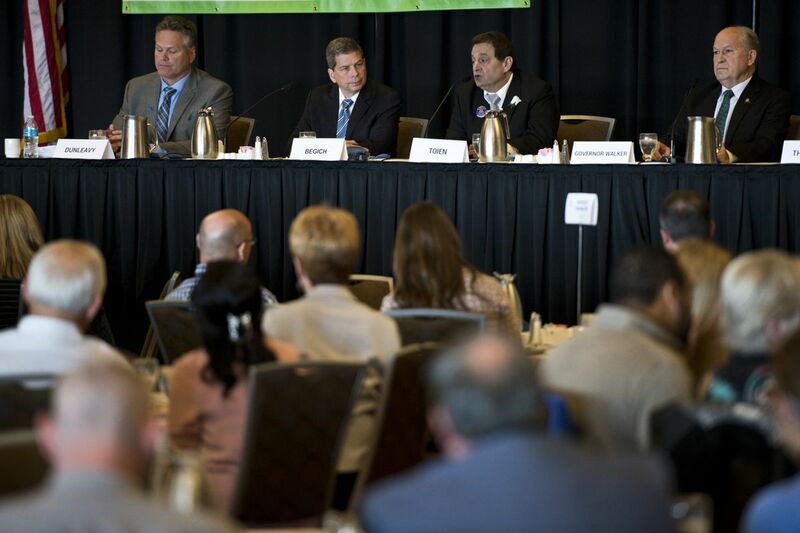 The past two Mondays, candidates for governor and U.S. Representative appeared at Anchorage Chamber of Commerce luncheons in the Dena'ina Civic and Convention Center. The gubernatorial "Make It Monday" forum drew about 250 people, the House forum perhaps 100. At the gubernatorial event, the moderator asked the candidates the same questions. The House candidates faced a different set of questions, but had time to answer only five as they were awkwardly paired with a panel of state Senate candidates who also required time. I understand why the Chamber adopted the same-question format: fairness and expediency. Every candidate is treated the same – no whiff of favoritism – and the answers come one after another like falling dominoes. I have used this format myself as a moderator. So I have no grounds for complaint. But the Chamber forums would have been more illuminating if the candidates had been able to question one another, if they had the opportunity to force their opponents to address their own weaknesses. Here are my impressions of the gubernatorial candidates. Mike Dunleavy: Republican. Dunleavy wants to restore the full Alaska Permanent Fund dividend to the level it was before Gov. Bill Walker cut it, reduce government and grow our way out of the budget shortfalls through new oil development. In other words, he is promising Alaskans the future will be easy if they just elect him. Actually, what Dunleavy's "just elect me" means is "just stop thinking." It should be obvious from recent history that the next governor is not going to enjoy a well-blazed path that avoids bogs and washouts. Dunleavy's breezy optimism is appealing, but if the proposals he is making were easy, elected officials would have implemented them long time ago. For decades, politicians have promised to diversify our economy. Dunleavy isn't promising that at all. He is a monoculturist – preaching oil, oil and more oil. Alaskans appreciate the benefits of oil, but they also know Alaska is vulnerable to price fluctuations. We need more oil, but oil is not a balm that cures all ills. Billy Toien: Libertarian. I have seen Toien as a candidate over the years. He has a certain charm despite knowing he is a human sacrifice who may get two or three percent of the vote in November. But onward he marches, armed with Libertarian talking points – the war on drugs is a failure, for starters. In closing, he said waggishly voters are warned that if they vote Libertarian, they are throwing their vote away – but if everybody threw away their vote, he would win. Mark Begich: Democrat. Once upon a time, Mark Begich was the boy wonder of Anchorage municipal politics. Now he is the experienced – and scarred – middle-aged veteran struggling in a comeback. Begich's battle plan seems to be winning enough segments of the electorate to produce victory overall. Hence, his appeal to old Democrats, new Democrats, young people, environmentalists, pro-choice voters and opponents of the Pebble Mine. His support for Ballot Measure No. 1, the so-called "Stand for Salmon" initiative, is smart politics. He is the only gubernatorial candidate voting "yes," and anti-Pebble voters know that. Begich's baggage – the size of a steamer trunk – is the question, "Why are you here?" The answer, which Begich avoids, is "Because I lost a United States Senate election and want a role on the big stage again." Begich says, in various ways, he's running to do what is right for Alaska. But every candidate says that. No politician takes to the podium to say "I want to do what's good for me." His exceptional talent as a political strategist is respected, admired, feared yet can make him look calculating, self-serving and dissembling – which is how he looks right now. Begich had everything going for him in 2014, when he lost the Senate race to Republican Dan Sullivan, except one thing – his party registration. He was an incumbent loaded with money, surrounded by bright people – and he lost to a plodding, if wealthy, neophyte because his Democratic Party label was impossible to escape in a red state. In a three-way race, the Democratic label can produce critical votes, volunteers, money – but Begich has discovered some Democrats have abandoned him for Gov. Walker and are not returning. Bill Walker: Independent. Politicians are actors, and after a full term as governor, Walker has clearly found a role he revels in: The straight-talking, apolitical, stand-up guy who tells it like it is and makes the tough decisions. Never mind that his critics find him vacillating, stumbling, weak. Walker makes his personal story central to his appeal. He's the kid born in territorial Alaska who grew up the hard way in Valdez and began to work shortly after after he learned to walk. Nothing has come easy in life for Bill Walker, the governor explains. And nothing came easy after he took the governor's seat after the 2014 election. He had to cut the dividend, had to reduce government – and did. Walker would agree with the New Yorker writer Peter De Vries, who said years ago, "Reality is that which won't go away no matter how much you want it to go away." Unfortunately for Walker, he is best known for knifing the dividend. When I shop at the local supermarket, people approach me from time to time to complain about the lower dividend. And complain about Walker. These people, if they vote, have one goal in mind: punish Walker. Don Young, 85, has been a member of Congress since 1973. For 45 years, journalists have struggled with the question "What is fair to Don Young?" Is it even possible to write anything unfair about a politician so blustery, bombastic, cruel to the English language and subject to fits of blarney? Yet reporters know Young has served his constituents – and moneyed interests – well enough to get re-elected time and again. Independent challenger Alyse Galvin, 53, is a smart, articulate woman with money and an organization running in the year of the woman. Young didn't get far from the starting gate before demeaning Galvin as his "so-called opponent." Then he turned to bluster. Asked about the dangers President Trump's trade policies present, Young announced, without bothering with evidence, that the trade dispute would soon be solved and Alaskans would be better off than ever. And he bragged that he had passed more bills than any congressman in history. Galvin clearly had prepared for this moment, and she had prepared to attack. So in response to this question and questions about the mounting federal deficit and health care, she called the gentleman from Fort Yukon powerless in committee, absent without leave when major issues faced Congress, the prisoner of special interests and indifferent to the plight of everyday Alaskans. Young professed to be shocked, announcing that he never expected this kind of treatment in this campaign. Then he did something I have never seen him do in decades of watching him: He whined. He whined, untruthfully, that he had never run a negative campaign, he whined that if Galvin was criticizing him, she was criticizing the people in the room who voted for him, and he whined that he now had to be the adult in the room. Finally, he whined that Galvin is a "nasty woman." To call a female candidate for Congress a "nasty woman" in 2018 is to call her a goddess. Later in the day, Galvin included video of Young saying "nasty woman" in her fundraising emails. Listening to Young whine in response to Galvin's barbs was listening to Goliath wail, "David hit me with a rock!" Not that his whines fell on deaf ears. There were people at the table near me – men – who sniggered at Galvin. When asked about health care for Alaskans, Young stumbled briefly before turning to blarney, claiming the Obamacare health care reform was the worst bill in the history of Congress. Really? Worse than the fugitive slave law that allowed slaveholders to enter free states and arrest escaped slaves? Worse than prohibition? Worse than laws that deprived Native Americans of their lands? Worse than (fill in the blank)? Young gets away with such ridiculous rhetoric because his supporters say "Oh that's just Don Young," as if a congressman not knowing what he is talking about is as natural as the wind and the waves. And so it went Don and Alyse, parry and thrust. Young doesn't get it. The #MeToo movement has changed the political landscape. He is not going to win re-election casting himself as the victim of a "nasty woman."